Day 1 of Group Stage #2 (or Day 5) of the League of Legends World Championship kicks off at PDT: 2 am | EDT: 5am | CEST: 11 am | KST: 6 pm. The Location has switched to Singapore where all 24 matches of the second Group Stage of LoL Worlds will be held. Day 1 starts of the first of two round robins with 6 matches involving Group C and Group D. The last 4 seeds in the upcoming Playoffs (Knockout Stage) of the World Championship are up for grabs for the top two teams of each group. In case you missed the original live stream a rebroadcast will take place about 1 hour after the original broadcast is over. All results will be updated in real time. 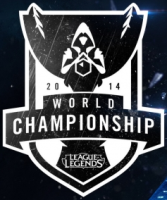 So there is nothing left to say than: Welcome to Day 1 of Group Stage #2 of the League of Legends World Championship 2014! 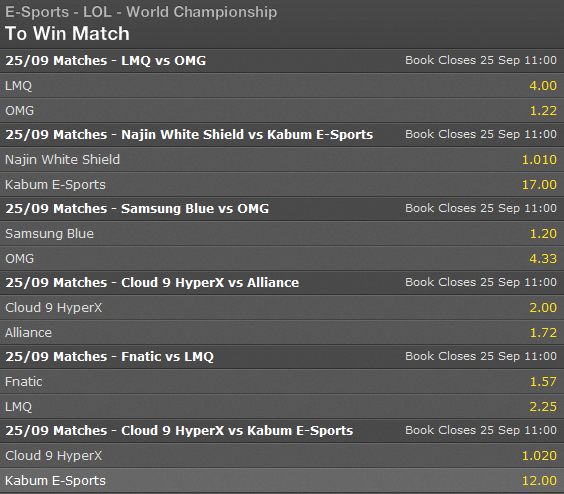 To find out more about the LoL betting sites take a look at our review section. 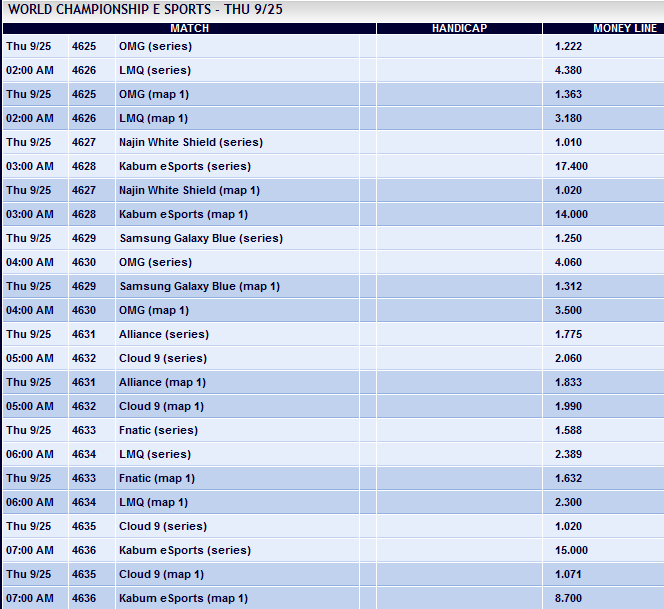 Odds may have changed by now – to take a look at the current odds follow the links to the webistes of the bookmakers. Group C is one of the most difficult group to get out of. Unlike Group A and B where there are clear frontrunners and the second position is the most coveted spot, Group C does not have a clear frontrunner just yet. One might think that Samsung Blue is the clear leader but they have no experience in international tournaments. But that is not the case. In this match, OMG has the upper hand since they have experience playing in international stage. Having experience in such a situation can lift off any nerves that the players will feel. This is why OMG has the better chance of getting their synergy together than LMQ does. Both teams are equally strong knowing that they have the signature Chinese aggression with a weak laning phase. This match will immediately blow up in the middle game when everyone has farmed up some gold. Both teams have favored well into the meta and it will be a blast watching these teams clashing on the Rift. What a way to open the games for the second part of the Group Stage. Prediction: Can go both ways but OMG still has the edge. The only thing that will take the game away from OMG is their aggression. One of the main frontrunners of Group D will be facing with one team that is shunned from the group – Kabum. Everyone will think that Shield will have this in the bag but there is still a shroud of mystery for Kabum's fate in this group and everything will be clear once all players are summoned on the Rift. However, in theory, Shield will have all the cards on this match against Kabum but as what everyone has learned during Season 2, never leave out a new international team as it may surprise us. Prediction: Najin White Shield if we have to go by the book. The third match of the day will be one of the most exciting matches of Day 1 of the second Group Stage. Samsung Blue is known to be one of the most methodical team in the world. Deft is a consistent AD carry and with Heart he is in good hands. Every aggression OMG will make will have to pass through Heart and with the sudden popularity of Janna and other disengage supports, OMG will have a hard time getting to Deft. Deft knows how to position very well and this is what separates him from Imp. He knows where he stands in the team and relies heavily on Heart to protect him. OMG's chance to get ahead is through teamfights and getting ahead in gold. As for now, we will need to watch the first game to make the right predictions for this match. Players to watch out: Deft and Heart at the bottom lane for Blue and Gogoing for OMG at the top lane. Prediction: Blue has way more chances of winning this match. The explosive matches just keep on coming thanks to the tight skill level of all the teams in both Groups C and D. This time, Cloud 9 and Alliance will face each other off in the international group stage. Although technically, the teams have not faced each other before, their reputation has preceeded them. Alliance has impressed everyone in Europe and there are even rumors that one of the few teams that might get in the way of a Korean champion is Alliance. Alliance has finally reached the superteam status they have dreamed about a year ago. 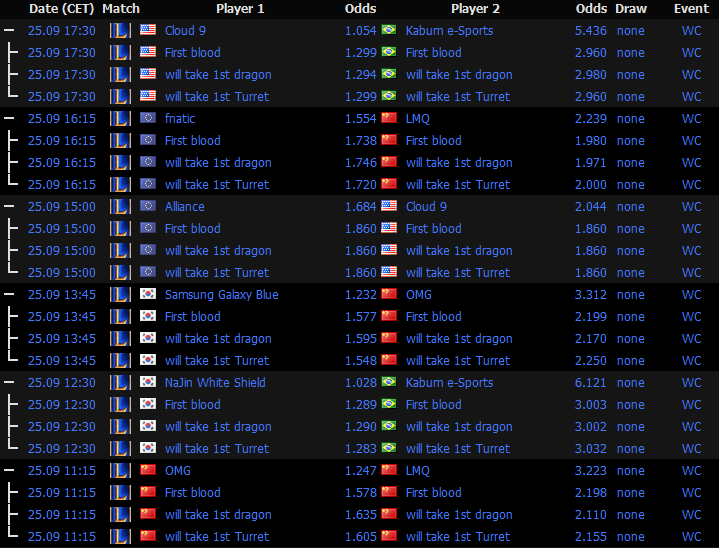 Meanwhile, Cloud 9 has become the Curse of the international tournament. Cloud 9 has all the consistencies you get in a team but being consistent is not enough especially if everything is at stake. Cloud 9 needs to take the risk and try new strategies. Hai needs to expand his champion pool especially he is up against Froggen in this match. Hai excels more at assassin champions while Froggen goes for the mage type. Both are very good but Froggen is better at the laning phase. Cloud 9 will have their backs against the wall this time but if they are consistent enough they will surely follow through with Alliance. They just need to make lesser mistakes than Alliance who seem to be one of the perfect teams in this tournament. Prediction: Alliance takes the win. After their first match against OMG, LMQ will have to strengthen their team whether or not they win or lose. Fnatic on the other hand will have to deal with another Chinese team in their midst in order to get out of the Group Stage. LMQ is not to be trifled with and it goes to show with their record. They have maintained a good lead throughout the entire Summer split of the LCS whereas Fnatic was in the middle of the pack. But, the thing about Fnatic is they can play to the best of their caliber if they need to hence LMQ will also face one of their worse adversaries in Fnatic. Fnatic will have the edge on this match since they can play methodically unlike LMQ. LMQ relies heavily on teamfightig synergy but their laning phase is weaker than Fnatic. One should watch the bot lane duos of both teams. Vasilii and Mor need to be careful when they are up against Rekkles and Yellowstar. LMQ needs to be extra careful not to give up kills to Rekkles who is known to snowball very hard when they are in the lead. Rekkles in known to carry his team on his back. He is a prodigy in this game so Mor, who is known to give kills in lane, need to be careful. Prediction: If LMQ can keep the laning phase death free, then they can proceed to teamfighting Fnatic where they can at least have a lead. Finally, the last match of the Group Stage 2 – Day 1 will tone things down a bit. Cloud 9 will face off with Kabum eSports and the good thing about this match is that both teams have seen each other play in the bigger stage back at PAX Prime. However, Kabum does not have that much international experience that Cloud 9 has. Cloud 9 has been doing it for a year or two now while Kabum has just qualified for Worlds. This might shock the Brazilian team but nevertheless, they will surely try to grab a win for this day. Prediction: Unfortunately, KaBuM are in a group that is one of the toughest to beat. C9 earn a point.